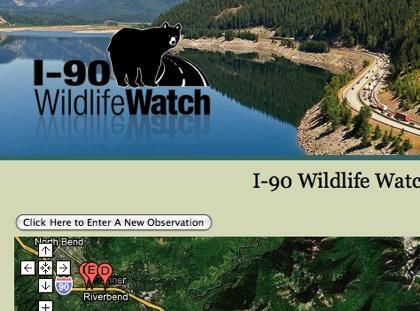 The I-90 Wildlife Watch website offers a way to report any wildlife you see while crossing the Cascades over Snoqualmie Pass. It's a multi-agency, multi-state effort that asks you keep your eyes open for animals along the road. An average of 28,000 drivers cross over Snoqualmie Pass each day. Even heavier Thanksgiving week traffic is just getting started. So there are well over 28,000 pairs of eyes that could be recruited for a study. Paula MacKay works for the Western Transportation Institute. She hopes drivers will report to a new website the time, location, and species of critters they see beside the road... dead or alive and no matter how large or small. MacKay says driver reports will be collected for the next year for the stretch of I-90 between North Bend and Easton, Washington. Right off the bat, she’s received sightings of deer and elk, black bear and otters. The following video is from the state Department of Transportation, and explains the efforts to reconnect wildlife corridors cut off over the years by the development and expansion of I-90, a problem officials are trying to address.